Kim Bolan, veteran crime reporter of The Vancouver Sun (submitted). The life of a journalist is a demanding one. In addition to dealing with long hours and waning pay grade, students in university journalism programs are told repeatedly that the industry’s glory days are over. Despite the challenges, newsrooms are still evolving with the times, helping to shape—as well as being shaped by—a modern public. 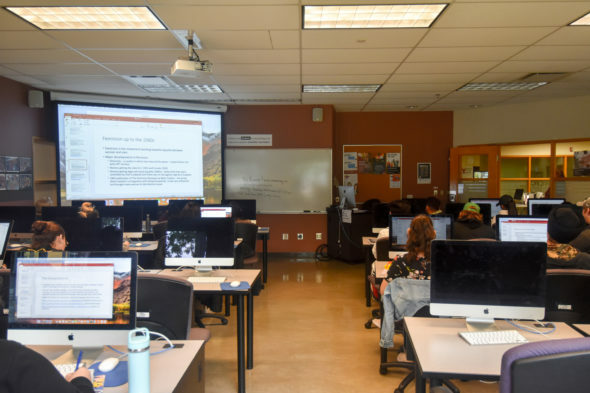 Even as newspapers are being shuttered around the country, students continue to attend classes in Kwantlen Polytechnic University’s journalism department. Many of them are prepared to become the reporters and broadcasters of tomorrow, even if those roles don’t exist in the forms that they have for most of the past century. Local outlets have been hit the hardest, with many smaller newspapers shrinking in size, merging with other outlets, or being shut down completely. Even one of Vancouver’s largest newsrooms, The Vancouver Sun, has not been immune to these industry changes. Kim Bolan, a 34-year veteran of The Vancouver Sun, is more aware of the industry’s decline than most. The Vancouver Sun, she explains, used to employ a wide variety of reporters to focus on certain topics or “beats.” Because of the downsizing at The Sun, Bolan says this style of print journalism has all but disappeared. “Like many newsrooms across the country, we’ve really been decimated in terms of loss of staff,” Bolan says. Across Canada, “169 news outlets either closed outright or were merged into other outlets between 2008 and late 2016,” according to a report by the Public Policy Forum called Shattered Mirror. The report states that the number of newspapers sold per 100 households in 1950 was 102. In 2015, that number dwindled to 18 newspapers sold per 100 households, and it’s projected that it will further decrease to just two newspapers by 2025. Today’s journalists must possess a wider skillset than any of those before them. In addition to conducting research for stories, they must also develop sources, take photos and video, and distribute their work on social media. While the workload is heavier, Bolan notes that modern technology, particularly social media, has made information much more readily accessible to reporters. In a time when “journalists know a little bit about a lot,” she has learned how to navigate and obtain information from a wide variety of sources. She adds that, despite many modern complaints about biased reporting and “fake news,” public trust in journalism is up. To combat the misconception that reporters are not trustworthy, they must simply continue to report the truth, says Bolan. A July article published in University Affairs reported that, from 2010 to 2015, enrolment in Canadian journalism schools was around 5,500, but by the 2015-16 school year, there were less than 4,800 journalism students across Canada. Despite these numbers, Bolan believes that those interested in news and current events should still pursue a formal education in journalism. In the Lower Mainland, existing programs include KPU’s four-year Bachelor of Journalism program, two-year diploma programs at Langara and BCIT, and a master’s degree at UBC. Chair of KPU’s department of journalism, Mark Hamilton (Ashley Hyshka). 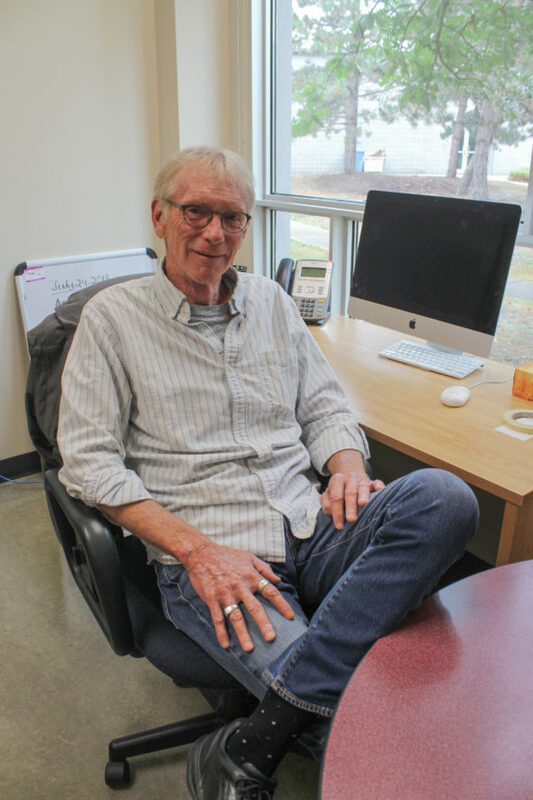 Mark Hamilton, the chair of KPU’s journalism department, is optimistic about the 2018-2019 school year. He says that KPU’s journalism department has been redesigned and has seen the addition of new classes as well as the removal and rebranding of others. The program has also been simplified in that the number of required courses has been reduced. Several former staff members have retired or are on leave, but new faculty members have been hired, including Pamela Post, a CBC reporter. Hamilton says that this shift in the department dynamic has allowed for a new set of skills that can be passed from professors to their students. The program’s two photojournalism courses have been rebranded as “visual journalism” and teach students how to work with both photography and video. Two audio storytelling courses have also been added, which Hamilton says were introduced due to the rising popularity of podcasts. While prospective journalists can learn many of the skills they need by jumping right into the industry, something Hamilton himself did, he says that the technical, writing, and critical thinking skills taught in journalism school are invaluable. “Our students come out of this with an understanding about how we got here, so they understand what’s happening in the media landscape and start exploring and thinking, ‘Okay, what’s my role in that?’” he says. 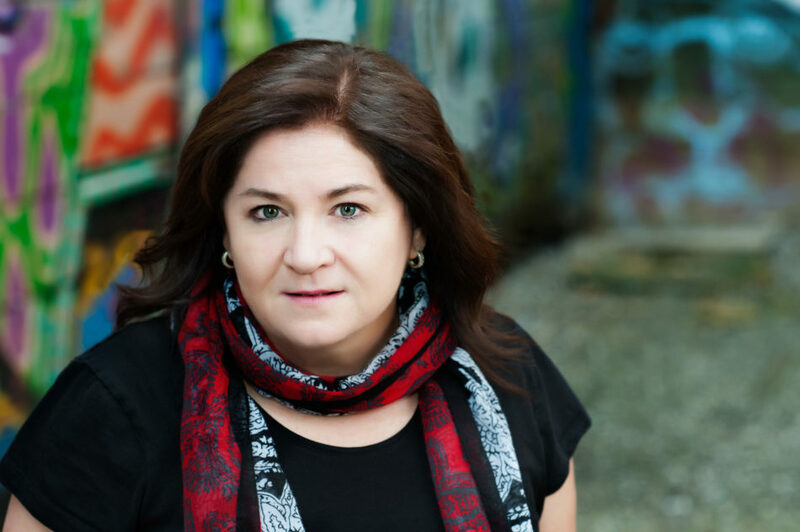 Bolan earned a bachelor’s degree from the University of Victoria, later received her master’s in journalism from Western University, and now teaches part-time at Langara. She recommends attending journalism school because it diversifies one’s skill set. Journalism schools now are constantly adapting to meet industry demands. Hamilton adds that, even after achieving a post-secondary degree, working journalists never stop learning new things. Earlier this year, University Affairs reported that the federal government committed $50 million over five years to support community-based journalism, and according to a recent survey by the Toronto Star, 94 per cent of Canadians believe that journalism is important to democracy. While some of the existing journalism jobs aren’t the glamorous, high paying, unionized careers of the past, Bolan says a wide array of positions remain available for young journalists. Skelton’s article about the evolving nature of the journalism industry explains that the declining number of journalists in Canada is due in part to the fact that they’re also working in various capacities. For example, “for every job lost in journalism since 2011, there have been 17 jobs added in public relations and advertising,” it reads. Hamilton says that many of KPU’s graduates have traditional journalism careers, but others enter communications and public relations or become freelancers. Others use the skills they learned at school to find success with other careers. His advice for aspiring journalists is to be proactive and to write and read often and fearlessly. He also suggests that, with an understanding of the changing media landscape, young journalists explore different avenues for which niches pique their curiosity. He believes that the people who are determined enough to succeed in this industry will do so.